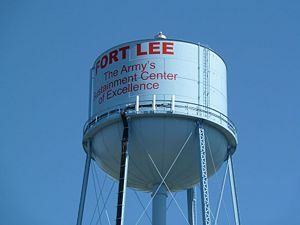 Fort Lee (4) (1917-Present) - First established in 1917 as Camp Lee (1). Named after Confederate General Robert E. Lee (Cullum 542). Active military installation. The first commander of the camp was Major General Adelbert Cronkhite (Cullum 2941), who formed the 80th U.S. Infantry Division on 27 Aug 1917 and initiated troop training. The 80th arrived at Camp Lee in September 1917 and departed for France in June 1918. The 80th distinguished itself in combat suffering 1,141 killed and 5,622 wounded. The 80th returned to the U.S. via the Newport News Port of Embarkation in May 1919 and was demobilized on 26 Jun 1919. At the end of the war the camp became a demobilization center until it was abandoned.The temporary buildings were removed with portions of the reservation made into a wildlife preserve and part given to the Petersburg National Battlefield. Some portion of the reservation remained as a military post. 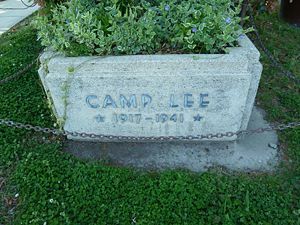 Camp Lee was reconstructed on the original site in 1940 as World War II became inevitable. 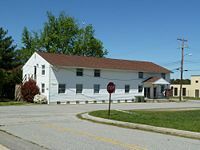 The post became an Army Quartermaster Corps Replacement Center in 1941. The camp evolved into the center for both the basic and advanced Quartermaster training. In the last year of the war, Camp Lee housed some 1,000 German prisoners of war. The Germans began arriving in February of 1944 from Italy and North Africa and continued through the end of the war. After the war, Camp Lee was kept as a permanent center for Quartermaster training and the post was renamed Fort Lee. 1918-12-04 1920-08-30 Maj.‑Gen. Bundy, Omar 3018 While commanding post, he was returned to the grade of Brigadier-General, June 30, 1920, then promoted again to Major-General July 3, 1920. Active military installation. 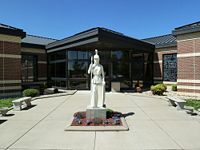 Two museums on base, the Quartermaster Museum and the U.S. Army Women's Museum. The U.S. Army Ordnance Museum which had a rich collection of U.S. and captured enemy fixed and mobile weapons systems is being moved from Aberdeen Proving Ground (APG) to Fort Lee. 2016 Update: The APG weapons collection has been moved to Fort Lee and is currently stored under cover awaiting construction funds for the new museum. The 12" Railway Gun that was at APG is on display in the Ordnance Campus area of the base. The German Leopold Railroad Gun is also on display. The Huge T-12 43,600 pound general purpose bomb now graces the center of the rotary at the intersection of Shop Road and 11th Street in a brand new coat of paint. Four or five other selected pieces from the collection are on display at the entrance rotary to the Ordnance Campus but the vast majority of the APG collection is in storage. Location: Prince George County, Virginia. This page was last modified 21:11, 7 January 2019 by John Stanton. Based on work by Bill Thayer.